The NEHA certificate programs have been designed for the range of individuals working in a food facility, whether manufacturing/processing or foodservice operations, to increase awareness of food safety hazards, learn how to control those hazards, preventive controls (SOPs), and understand personal hygiene, handling food safely, the flow of food through a facility, and the basics of pest control. Wondering the difference between Certificate Program, a Certification and Credential? Courses follow the principles of both the US FDA Food Code and the international Codex Alimentarius. For more information on NEHA Certifactions and Certificate Programs, please contact Trisha Bramwell at 303-756-9090 ext. 340 or at tbramwell@neha.org. "Managing food safety risks in a food/feed operations has never been more important." 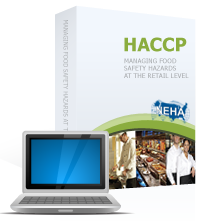 "Ensure your workforce is the most competent and well trained when it comes to food safety."